Fresh off of his devastating upset loss, Josh Koscheck will be making his return to the Octagon at UFC 98 against Chris Wilson. The brash American Kickboxing Academy fighter is looking to get his career back on track as he has dropped two of his last three bouts. Kos’ most recent loss came just two weekends ago at UFC 95 when Paulo Thiago knocked him out in the 1stRound of their battle. Wilson is also coming off of an upset loss. He dropped a close split decision to former IFL fighter John Howard at UFC 94 back in January. 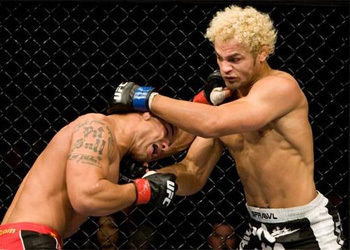 Earning a decisive win over Wilson is imperative for Koscheck’s hopes of earning a title shot in one of the UFC’s deepest divisions.